After the November update the WiFi doesn't work properly. As everytime we need to restart the phone to connect to WiFi. Previous version was having no issues but after the update, WiFi issue appeared. Have visited the service centre and factory reset also has been done for my device. Kindly request you to have a look at the issue and resolve in next ota upgrade. Same issue here. Seen multiple people report this issue on Reddit. Problem is not specific to any single Wifi router, therefore resetting is pointless. I didn't find any problems in my phone. My phone is working well in WiFi. Before update I have a problem with WiFi connectivity,but now it's working well. Mismo problema desde la actualización de Noviembre. Ha disminuido la velocidad. Tengo que reiniciar teléfono cada vez. No puedo volver a la instalación anterior. The update has an issue. As after the November update , my WiFi is not responding to any of ssid present nearby the device. I also ha ve a Wifi issue after the november update ! tried resetting the phone, erasing wifi preferences, etc... nothing will do, only way is restarting phone, but problem comes back after a few hours, very annoying ! Now need to have Nokia technology team to have a look at the issues. I have even written the issue to the Nokia mobile on twitter. Even reported the same to the Facebook page but no response. Have same issue after last update. I've logged the issue with Nokia Support via the Support app. They claim to be aware of the issue and claim their developers are working on a fix. I suggest everyone reports the issue to Nokia/HMD. Im facing the same issue now. Can anyone from Nokia team reposnd to all the queries.????? Yup, WiFi connection drops quite often. Generally so many bugs after Android Pie. No use of the fast update cycle if those aren't tested! Is it possible to get Android 8.0 from anywhere? Maybe should go back to Samsung. I had even written a mail to [email protected] , where the customer representative has told to wait for the next update. The next update would resolve the wifi issues. I request all the members in the discussion to write a mail to the above mentioned mail id regarding the issues. Guys please don't update your mobile to December 2018 update for Nokia 7 plus. It doesn't resolve the WiFi but even more worsen it. After the update I am having same issue again. Just a warning before taking any action. Very worst support from the Nokia tech team. Hi, I have a Nokia 7 plus TA-1055 Italy, I've never had problems with the 2.4 ghz wifi and even with the 5 ghz. The battery does 8 hours of screen turned on in 2 days, I have android 9 updated in December. I think the WiFi problems were introduced with 3.39B update. Those of us who only got November security update, probably don't have such issues. But we didn't also get some fixes as well so. The problem is with the ta -1045 model Nokia 7 plus India . @Amogh Kakirde same issue with me also. No resolution from the Nokia tech team yet. Hope Nokia is having look at the discussions. same here. showing neighbor wifi and mine not. Other devices no problem at same time. Keeps dropping my WiFi connection too December patch. 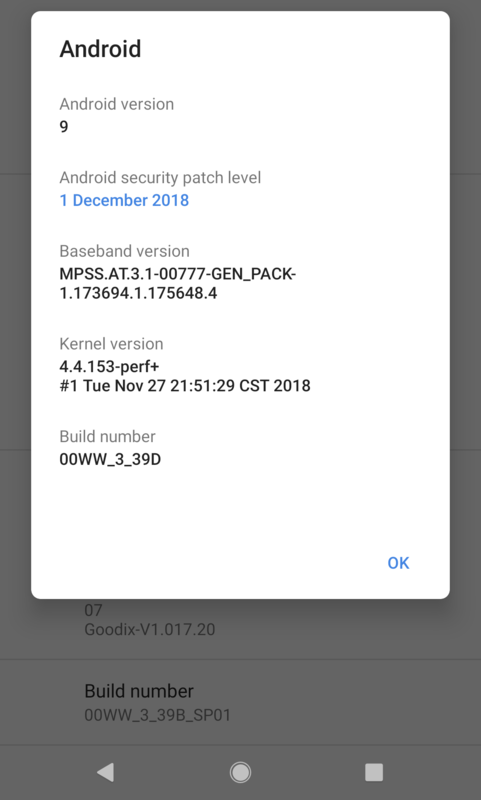 same here since update from oreo august patch to pie november and december patch. wifi worked like a charm when i bought phone. after two weeks pie ota came in and now wifi is a mess. cant reconnect after flight mode, have to restart phone every time. phone switches between 5ghz and 2ghz like a maniac, have to restart the phone, after that it works, sittin on the same spot in my flat. i am going to go go back to oreo if nokia doesnt solve that issue. Please send a mail to the [email protected] for the issue which you are facing. I have replied them back with the issues. You can even get the send mail via logging to nokia.com and then raise a mail regarding the problem. I have the same problem on my N7+ with WLAN. Did a factory reset yesterday, but I don't believe that it will help, since some users already did it and the WLAN issue persists. I hope there is a fix soon. Hi Guys, just to let you know. I did a factory reset on Saturday and since then the WLAN issue didn't come back. WLAN is working fine, even after several hours in flight mode during the night and when I'm at work. Hi, I have done factory reset, hard reset and yet the issue still persists. WiFi after being off for a while will cause issues randomly until you reboot your N7+. It seems that the adaptive battery function which was part of the log of what was updated during the November patch might have caused this issue. 😔 Was advised by chat support to simply wait for new update.